What a fantastic idea – OMGWTFBBQ it’s going to ROCK!! Why has no one thought of it before?? As a sometime born-again geek, brought back into the fold after years of denial (yes, because working in IT is completely not geeky, is it? I was even in denial about that! ), the idea of a Con ALL ABOUT ME was fantastic. We really are living in a golden age (/The Master). After I got over the initial excitement I started to think about what I would love to see there: Geeky women passionate about their geekiness, bringing other people into their sense of wonder. What is my passion? That would be writing and webseries. I started to hope that there would be programming about webseries, waiting to hear if some of my favourite creators would be there. On Monday this week I receieved the email saying our Panel “Women in Webseries: Indie TV and Getting Out There” had been accepted – fantastic news! Except for one thing. The maximum number of people allowed on stage was 9, and we had 10 people who wanted to participate. Everyone wanted to be part of the panel and everyone had unique perspectives and experiences to bring. What could be done? Now, in traditional TVsoapland this would be the cue for infighting, backstabbing and hair pulling, because isn’t that what women do? No. They don’t. Passionate and professional women set out the options, discuss them and come to a consensus. Trin Miller very graciously came forward first and said she would sit out in the audience instead. This set the ball rolling and the discussion that followed was illuminating. Josephine Hoy, Susan Bernhardt and Jillian Clare also offered to drop out. The truth is no one wanted to miss being on the panel, but everyone wanted it to be fair. In the end a compromise was reached. Trin Miller will not be officially on the panel (only because we need to fulfill the GGC requirements) but she would be acknowledged by the panel and will conduct the audience participation parts. Because when you come to our panel, you’re going to have fun. And lots of it. Are you excited yet? I had confirmation today that our panel will be on SATURDAY OCT 8, and will be a 90 minute panel. Better book your tickets for Geek Girl Con soon because it's going to be legendary! Joss Whedon to speak at the LA Can't Stop The Serenity (CSTS) event! I'm already counting down the days until I attend the 6th Annual Vancouver Can't Stop The Serenity day at the H.R. MacMillan Space Centre, 1100 Chestnut Street, Vancouver, BC, on June 25th (11 am until 6 pm). It will my fourth year and I look forward to it for weeks in advance! CSTS is a global sci-fi charity event all about raising money and awareness for Equality Now and other charities. We had a wonderful time, met friends old and new, and more importantly the BC Browncoats raised lots of money for Equality Now and the BC Women's Hospital and Health Centre Foundation. Because that is what CSTS is all about - communities coming together to raise money causes we believe in - all while enjoying some high class entertainment with friends. “Because equality is not a concept. It's not something we should be striving for. It's a necessity. Equality is like gravity. We need it to stand on this earth as men and women. And the misogyny that is in every culture is not a true part of the human condition. It is life out of balance, and that imbalance is sucking something out of the soul of every man and woman who is confronted with it. A very special announcement for the 2011 season is that Joss Whedon himself will be attending and speaking at one of the events: Can’t Stop The Serenity in Los Angeles on June 25th, hosted by the California Browncoats. Taking the excitement one step further, the event will be broadcast live via the web so people can enjoy the night from around the world. Using multiple cameras, the feed will show the live events from the stage, interviews with attendees and general footage to capture every moment from this unprecedented event. 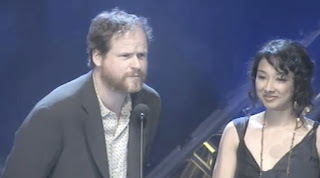 Yes, you fall over stars and starlets on every corner in LA, but this year Joss Whedon himself will attend the LA CSTS. This is wonderful news and should mean even more money can be raised. I predict that tickets for the LA CSTS will be selling out right about now....[Edit: they are sold out in LA but check out all the CSTS events on the CSTS website] But that's ok, because we'll all be able to join in, live! We might not have Joss Whedon, but I know the Gayle and all the team have worked out a magnificent day for us all in Vancouver and will be putting on another brilliant day. We'll be there - and we have a very special announcement to make about what we will be doing there soon. 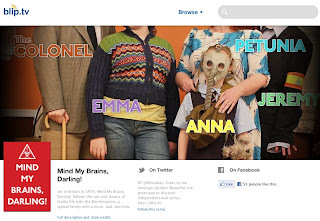 But it might have something to do with our new webseries "Mind My Brains, Darling! "....More soon! Blip.tv, The Collective and Jane Espenson - #webseries news! "This partnership breaks new ground for blip.tv and validates the position we’ve taken for years about the relevance of original web series, and our dedication to the success of their creators. The Collective, like us, takes a long-term view that places the creator and star firmly in control of their own destiny.Our partnership was the result of a ton of exploration about how we can work together to add value to the web series creators who will be a part of it. 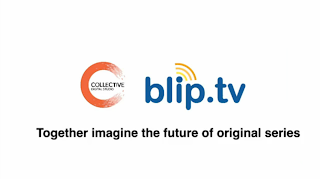 Starting today, the creators working with Collective Digital Studio will build upon their amazing success by adding new audiences on the blip.tv destination site and our network of distribution partners. We’ll also work with them to take advantage of opportunities with advertisers so that they can make more and better content for their fans, which will be available on the new blip.tv destination site, on YouTube, and on their own sites." Tubefiler had live coverage and Newteevee have also covered this news. I'm looking forward to seeing what this new partnership will bring. More things that make you go "Squee!" One of my very favourite TV writers - in fact, one of my favourite writers, period - is Jane Espenson. I first encountered her on Buffy and I have tracked her since, enjoying her work whenever and wherever I find it. We won't dwell on the heartbreak that is the cancellation of Caprica, but rather rejoice in the fact that Jane has several projects on the go. There is a wonderful interview with her in the Huffington Post today. "Is there a story you're dying to tell? If you were given complete freedom, ratings weren't an issue and there were no studio restraints, what story would you write? I do have such a story -- a comedy idea a friend and I came up with and co-wrote a little script for. It's something that I think would inevitably change with studio input, and I want to keep it clear in my head at least until we've captured our clean vision of it, so I think we will shoot it as a web series. Ask me about it again in about a month or so!" P.S. If you are reading this, Jane, I really do have a set you can use - @worldofhiglet on twitter and I'll hook you up. You like Vancouver, right? EDIT: During #webserieschat today I realised that some people might not know that Jane is a Streamy Award winning webseries writer! She won in 2009 for the Battlestar Galactica webseries, "Face of the Enemy". I blogged about it here and here - and have some pictures on Flickr. She has also been linked to a new Torchwood webseries!